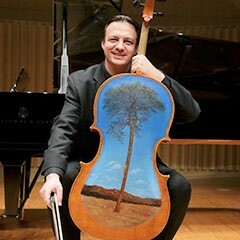 Cellist and USC Thornton alumnus Marek Szpakiewicz (MM ’01, DMA ’08) will be featured as a soloist in a March 13 concert with pianist Fuzjko Hemming. The concert, at the Colburn School’s Zipper Hall, will commemorate the fifth anniversary of the 2011 Tohuku earthquake and tsunami. Featuring music from Schubert to Mozart to Brahms, the event is supported by the Consulate General of Japan and the Republic of Poland, with a portion of the proceeds benefiting the 2011 Japan Relief Fund. This is not the first time that Szpakiewicz has been involved in supporting victims of the Tohuku earthquake. In 2011, he organized a charity musical event to raise funds for victims and in 2014 he visited the Soma Children’s Orchestra in Fukushima. Szpakiewicz has also performed on the Tsunami Cello (pictured), an instrument crafted using debris from the 2011 disaster.